Published By – Goodsingle Ltd. Published By – Calypso Toonz Inc. Published By – AJM Creative Services Ltd.
Management – Roger Davies Management Inc.
Cat # is without space on disc, elsewhere with space. Producers credited both release-wide (back cover) and track-specific (inlay) in this release. ℗ 1986 Original sound recording made by Capitol Records, Inc. Recorded and mixed at Mayfair Studios. 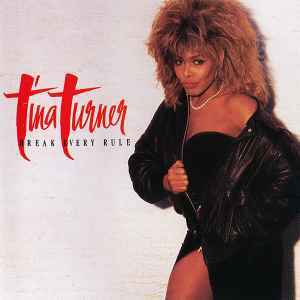 Tina's vocals recorded at Studio Grand Armée - Paris France. Mastered at Precision Lacquers, Los Angeles. Warner Bros. Music/Rondor Music (London) Ltd./Goodsingle Ltd.
2 to 4. Warner Bros. Music/Rondor Music (London) Ltd./Goodsingle Ltd.
7. Bryan Adams appears courtesy of A&M Records Inc.
Rondor Music (London) Ltd./Adams Communications Inc./Calypso Toonz Inc.
8, 11. Jamie West-Oram appears courtesy of MCA Records Inc.
AJM Creative Services Ltd./Rats Said The Tyrant/CBS Songs Ltd.
Rondor Music (London) Ltd./Strait Jacket Songs Ltd.
Samanta Brown appears courtesy of A&M Records Ltd.